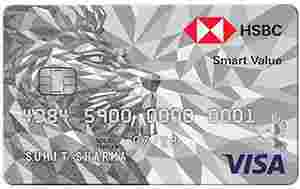 HSBC Smart Value Credit Card is typically available to those with good credit scores (650 or greater). - Get ₹2000 Cleartrip voucher & ₹250 Amazon Gift Voucher on first transaction of any amount within 30 days of credit card issuance. - Get 10% cashback for making a minimum of 5 purchase transactions, totalling to ₹5,000 or more during the first 60 days of issuance subject to a maximum cashback of ₹1000. - Receive Amazon Vouchers worth ₹500 on payment of annual fee.